Well, no I didn’t. “So how do you know it’ll happen to me?” asked my young lawyer in training who continued to cross his eyes and look at himself in the car mirror. I thought about it and gave my best Mom answer: Because I said so. Then I started thinking about the other stuff my Mom told me when I was his age. How much of this was true and how much was just mom’s doing what mom’s do best – worry? This was said constantly when I was growing up. I spent my first 13 years living in Miami and we were literally, surrounded by water. If we weren’t at the beach, we were at someone’s pool. Everyone’s mom had the same rule so we would all sit outside, getting hot and counting down the time until we could get back in the water. Mom: No, it’s only been 30 minutes. Me: Come on Mom, I swear I won’t complain if I get sick from going in the water too soon. Mom: No, something will happen and you’ll end up at the doctor’s. Do you want to spend the rest of the day in hospital? I totally thought this one was from some paranoid Mom until 5 years ago. I ran into a friend with her little boy at the park one day. As we sent our kids off to play, she told me the story about how her son was running with a long stick, fell down and and got hurt. I’ll spare you the gory details but let’s just say I buy my son the little kid rounded edge scissors and I keep my eye on him if he walks around the house with them. 3. Stop messing around. When you fall down and break your legs, don’t come running to me. 4. One day you’ll have kids just like you. This one reminded me of a conversation Jake and I had last year. Jake: Am I normal or not? Jake: Compared to you. Am I more normal than you? Me: Funny question, why would you ask me that? Me: Well, Jake I believe I got everything Grandma told me I would get. I got you …. Funny! I am still big on don’t run with scissors. I probably always will be. I never really bought into the cross eyes thing, but it would be horrible if it could happen. Could you imagine showing up at the doctors and he says, well didn’t you know this would happen. You should have warned your kids about doing this. I am guilty of all of these, I’m afraid…passing down that Mom folklore to my daughter! Its so hard to NOT to say it. I mean, he looked at me with those cross-eyes and I didn’t even hesitate and just said your eyes will stick like that. It was like a reflex. This is a great list–I heard all of these growing up! I didn’t hear that one but my sister would be fighting and she’d say, if you don’t stop, I’ll turn this car around. Did you hear that one? Not too much. They said it once or twice, but they usually went for the blind threat of leaving me stranded in the middle of nowhere. I couldn’t imagine saying that to my son now. He takes everything so literal that he’d really think I’d leave him on the side of the road. He does that ALL the time. He loves the idea that he’s weirder than me (and I’m pretty darn weird) and he asks my mom/his grandma if he’s better or worse than I was when I was his age. I’ll have to take a look at that video – sounds pretty funny! I like that last conversation. Very funny. I always wondered about the swimming and food thing. Is it true? Yep, getting better since my meeting with my friend on Friday. I’ll email you back and give you more details. As for the swimming stuff, I always thought it was true but it really doesn’t matter when you get back in the water. It’s just this thing our mothers have drilled into our heads so we believe it. Glad to hear the block is dissipating. Hahahaha! I think our mother’s were given a book of saying when they left the hospital. Our generation just believed whatever our parents told us…the next generation, not so much. Living with a lawyer isn’t easy…hahahaha! “Am I more normal than you?” – what a GREAT question. Aren’t we all wondering that when we look around? Hurray for him-I hope he is always confident enough to embrace his weirdness. oooh yeah the scissors and stick and pencils = no damn running! That closing conversation between you and your son is priceless. Haha! We had that conversation at dinner one night and when we were done, I wrote the whole thing down so I would have remembered it. And yes, the running with scissors bit is a good tip. Sometimes, we have our moments. PS – your kid sounds awesome! Isn’t funny how we just believed our moms and our kids question us? Must be the over-access to the internet where they can look things up. My mother used to tell me that if I got hurt she was NOT taking me to the hospital. And I realized I say that to my son too. Which is horrible, when you think about it, that I would be denied and that I would deny my child necessary medical attention. But I get the point. I guess. Anyway, it didn’t work for me and it doesn’t work for my kid either. Your son sounds great – I love the way he thinks! I believe the not swimming after eating warning, because when I was in my 20’s I went for a short jog after eating pasta. After 10 minutes, I doubled over in pain. If I was in a pool, I would have drowned. You see, that’s what I always thought would happen! 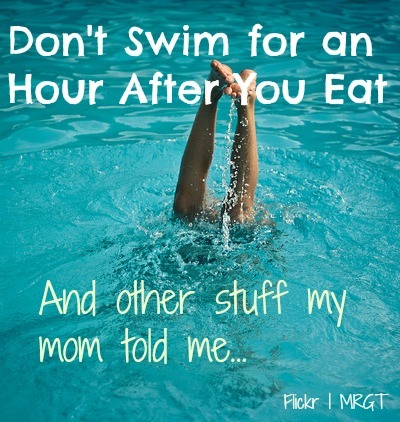 But I actually looked it up and there isn’t any scientific proof about the amount of time you should digest your food before swimming. Maybe you’re proof that our moms had some reason for concern. During that run, I was totally disabled and collapsed on the ground until the spasms subsided. It made a believer out of me! That’s what I always believed would happen if you swim too soon after eating. Good to hear that you’re ok now. Haha. I generally trusted my mom’s advice, because she was usually right.